Silva Screen Records have announced the release of Doctor Who - The Krotons, in digital format, July 16, 2013. 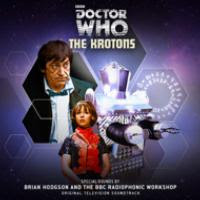 This is the second archive release of a Doctor Who soundtrack since the Doctor Who 2005 British TV comeback, featuring a collection of 'special sounds' by British electronic composer Brian Hodgson. Brian Hodgson was a member of the BBC Radiophonic Workshop and worked closely with Delia Derbyshire, the seminal figure of English electronic music. As the original sound effects creator for Doctor Who he was responsible for the chilling Dalek voices and the powerhouse sound of the TARDIS lifting off. Brian created the TARDIS sound in 1963, running a back door key for his mother's house along the bass string of a dismembered piano and treating it electronically. The sound of the TARDIS lift-off is still in use. Brian comments: "I spent a long time in planning the TARDIS sound, I wanted a sound that seemed to be travelling in two directions at once; coming and going at the same time." The collection displays Brian's highly innovative techniques that, together with Delia Derbyshire's experiments in modes and tunings, became the staple of British electronica. The 1963 Doctor Who theme kicked off the Golden Age of the Radiophonic Workshop. Brain Hodgson says of his work: "I never used to call the stuff I made myself 'music'. I was more interested in what I called the theatre of sound. I was creating atmospheres that were not conventionally music in their form. Nobody sat down to create a piece of formal electronic music, it was always a contribution to enhance a radio or television program. I think that's what gave the Workshop its vivacity."